The cane I was building when I generated the scraps below; kaleidoscoped. I believe that paying attention to color as we go about our daily activities builds a reservoir of understanding that will ultimately enrich our art. 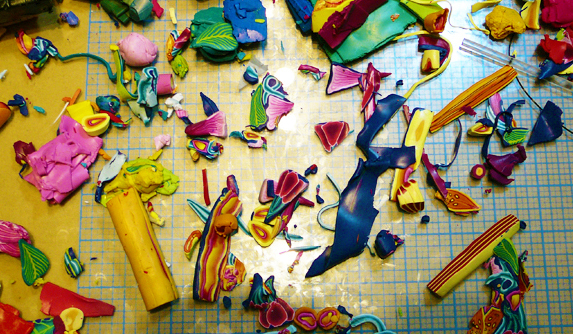 For example, because of my poor work habits, my work surface is usually littered with scraps of clay at the end of a project. 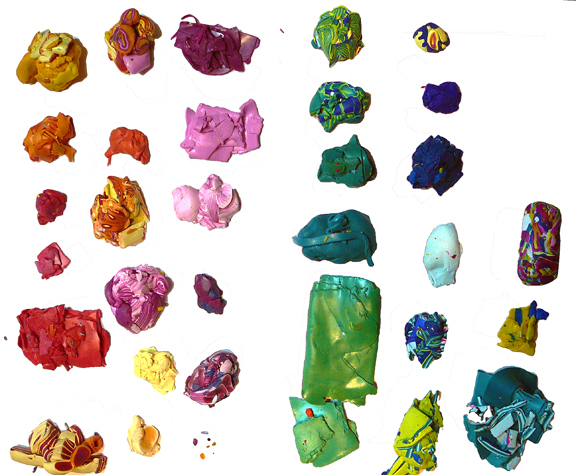 Unless I want to end up with one big ball of “mud,” I have to sort the scraps into color groups as part of cleaning up. 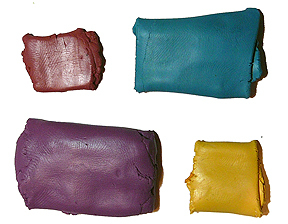 The sorting process provides good practice in color matching. When I pick up a scrap of green I have to decide which of my different piles of green I should put it in. If my piles of greens are similar to each other in hue, I try to pick the best match as I lift the scrap rather than waiting until the scrap is closer to the piles. A representative section of my work surface after my latest project. Right or wrong, I’ve learned something about color in the process. Sometimes I’ll notice two scraps side by side that look particularly beautiful together. I make a mental note to try putting them together in a future project. Piles of clay sorted by hue. 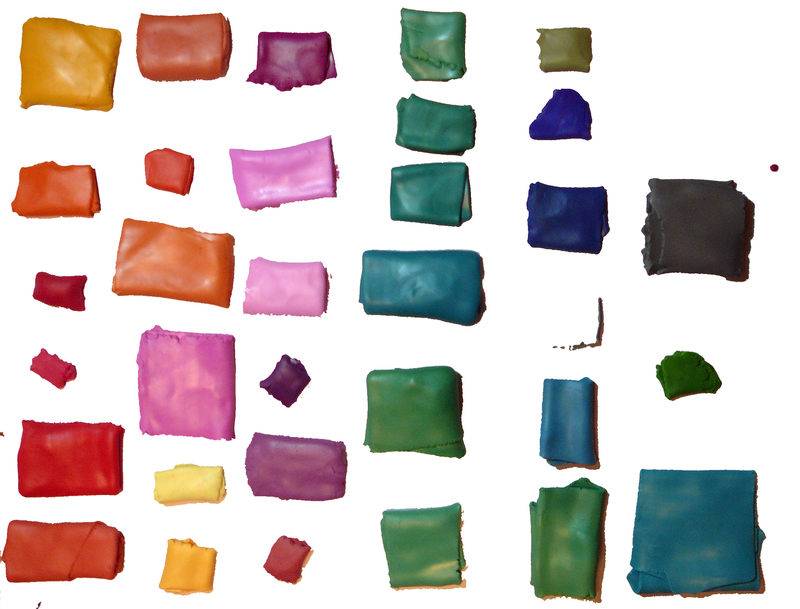 If there is enough scrap, I separate light, dark and medium values of the same hue into separate groups. This leaves me with more options for how I use the clay in future projects. Now comes the fun part: I blend the piles individually using the pasta machine, creating an entirely new range of colors. Piles of clay after blending. Locations of blends match original piles. The cane I constructed was for one of my classes. I started with only fuschia, zinc yellow, cobalt blue, white and a tiny bit of black. The colors in the cane were extremely vibrant, except where I lightened them with white. These new colors are less vibrant because most of them contain a little bit of a third primary as well as quite a bit of white, but I love them for their richness. When I mix colors for a project, I almost always add a bit of a third primary to “knock the brightness down a bit.” To my eye, muting or desaturating the colors a bit adds interest, a bit of the unexpected, and makes them more beautiful. 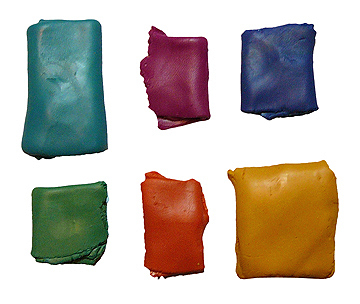 Because all of the colors above were mixed with the same primaries, the blends all go together as well. None of the colors jump out as not fitting. One other thing I often do is pull out individual colors and put them in groups that I think go well together. These are some of the groupings from the collection above. I seldom take notes and never save “recipes.” I just try to pay full attention to what I’m seeing and store the knowledge in my subconscious. I truly believe that doing this gives me a repository of color “sense” to draw on in the future. This entry was posted in Caning, Color, color mixing, color theory, Kaleidoscopes, Premo Clay, Sources of Inspiration, Teaching and tagged Carol Simmons, Color, Color Mixing, Kaleidoscope Canes, polymer clay, Polymer Clay Classes, Polymer Clay Colorado, Polymer Clay Teachers, Polymer Clay Techniques, Polymer Clay Workshops. Bookmark the permalink. Thanks for sharing this. The colours you have recycled are great!! Aren’t they wonderful? It happens every time. Thanks Sue. I appreciate your comments. Thank you for sharing your recicle technique!! I think it will be working to do cabuchons to. You are welcome. I’m glad it was helpful. Carol, where’s the cane from which these scraps fell? I’m curious. I thought someone would ask so I brought my camera into my studio. I have inserted the picture into the post. 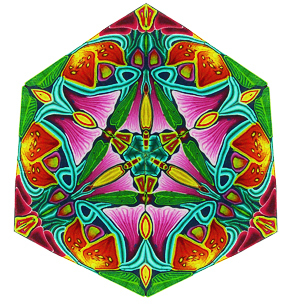 The remainder of the cane was make into square kaleidoscope designs to use for veneers. Fabulous lesson on how to recycle those bits into something useful! Will definitely keep this in mind. That is one gorgeous cane. And the leftover colors are beautiful, too! Thank you, Lisa. Isn’t it cool that you end up with a whole set of new colors to inspire another project? I love it. My work space looks a lot like yours. I create and create and create and the It is then VIOLA (Wahla, Wahlah, Wahala)!!! I crash into blissful sleep awakening like a buttefly emerging from the chrysalis in the morning dew. I’ve just discovered your blog and can’t drag myself away. Wonderful!